The retailer is planning an offering of around $1.5 billion worth of depositary receipts in 2014. The supermarket chain Lenta, one of Russia’s biggest retailers, is in talks about an initial public offering on the London Stock Exchange, TV channel Sky News reported, citing sources in the investment community. Apparently, Lenta representatives are in London talking to investment bankers about a listing on the stock exchange. The plan is to place depositary receipts for Lenta shares worth approximately $1.5 billion. “Meetings in London with prospective investors and analysts take place regularly. There are no specific plans for raising money through a stock exchange at the moment,” a source close to one of the shareholders told Vedomosti. “The company is at the very beginning of its path toward an IPO. Actual preparations for the offering will start next year,” a source close to another shareholder said. The majority owner of Lenta is the American investment fund TPG Capital, which, according to a February presentation, holds 50.1 percent of the retailer. The European Bank for Construction and Development (EBRD) owns another 21.6 percent, VTB Capital holds 11.8 percent, and various minority shareholders have 16.4 percent (5.9 percent). VTB is currently Lenta’s biggest creditor. The bank increased its credit facility for the company in April, from 25.4 billion rubles ($800 million) to almost 40.4 billion rubles ($1.2 billion). The company needs additional funds for business development, VTB Capital Private Equity and Special Projects Division head Tim Demchenko said at the time: The retailer has ambitious projects for this year, such as opening new stores in existing and new regions. Lenta plans to open 18 stores annually and beginning in 2013, including through expansion into Moscow Region, the company said in a February 2013 bond placement presentation for investors. Managing 56 supermarkets across Russia, Lenta is a top-10 Russian retailer in terms of size and is considered one of the most efficient ones. Revenue rose 22.4 percent in 2012 to 109.9 billion rubles ($3.4 billion); net income quintupled to 6.3 billion rubles ($197 million); and the EBITDA margin amounted to 11.6 percent. 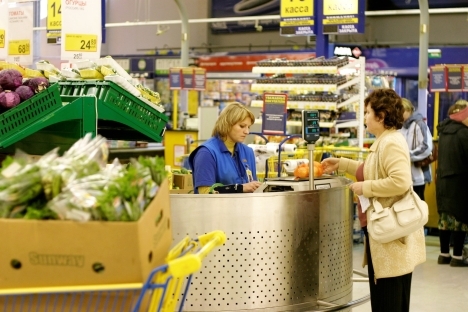 The company is planning to expand its chain by 14-18 supermarkets in 2013, Lenta CEO Jan Dunning told Interfaxin late March. Capex will reach 78.8 billion rubles ($2.4 billion) in 2013-2016, while revenues will rise to 289.2 billion rubles ($9 billion) in 2016, up from 109.9 billion rubles in 2012, the company projected in its presentation. First published in Russian in Vedomosti newspaper.